Andy and I love thai food and I cook the occasionally noodle dish for us all and Alice loves it. But, when choosing a restaurant to eat out at with the girls, its not something we ever consider. 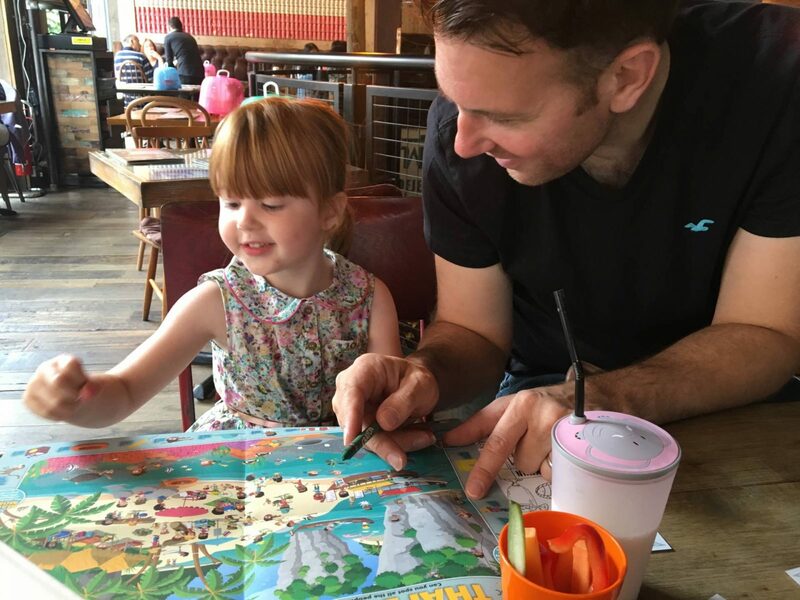 When Thaikhun invited us to try out their restaurant in Oxford, we checked out the kids menu online and we were pleasantly surprised to see there was plenty of choice for Alice and Holly. We haven’t taken the girls to Oxford before and it involves a park and ride on the bus, which they were very excited about. After a quick shop for Alice’s school shoes it was time to head to Thaikhun for lunch. As soon as we walked in it felt like we had stepped into Thailand, with a tuk-tuk greeting us. The restaurant was decorated brilliantly and there was so much to look at, this also helped with entertaining the girls. 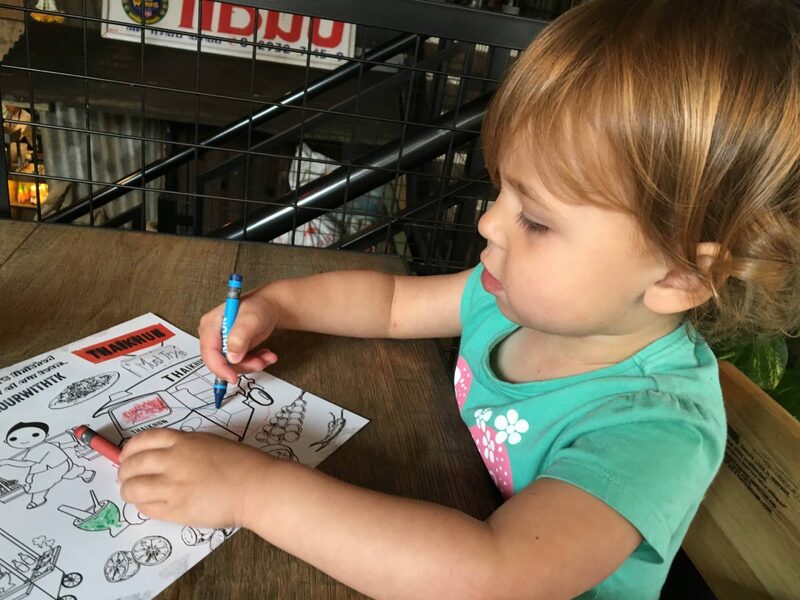 The children’s menu was a three step process, which means there is something for everyone. Along with vegetable sticks to start, a drink and an ice lolly for dessert, all for £5.95. The girls were given colouring and a fold out map of a thai beach holiday, which you had to spot all the items around the edge within the map. This kept them both happy while we waited and they didn’t have to wait long for the vegetable sticks to arrive. Both the girls had milk to drink and it’s the first restaurant we’ve been to which had a cup with a secure lid on top. This meant that we didn’t need to keep helping Holly with her drink, and she loved it. The girls meals arrived swiftly and they both had the noodles, grilled chicken and sweet bbq sauce. Their meals came out on a tray style plate with everything separate, plus a plastic spoon and folk. They both liked dipping their chicken in the sauce. The noodles were a bit tricker to eat as they were all stuck together in a big mass and because there are no knifes provided, not even for the adults. It was difficult to pull them apart for them to eat. 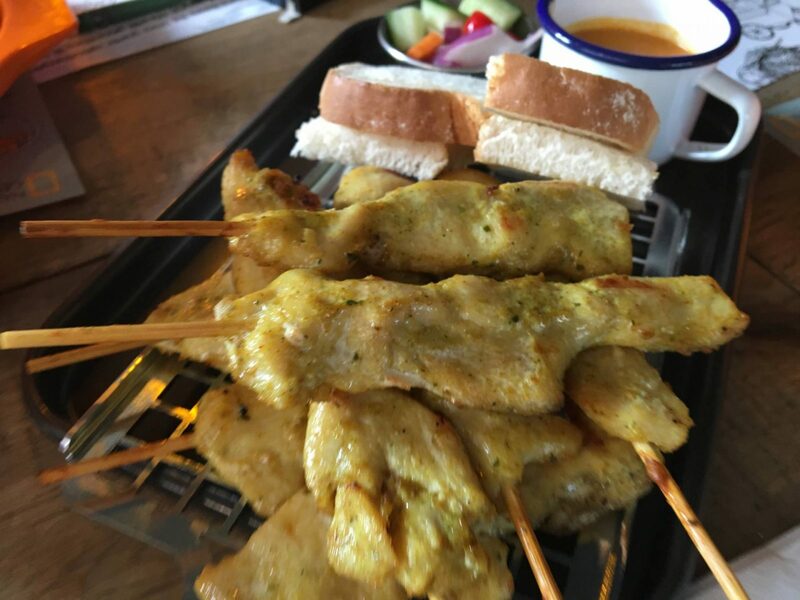 Andy and I had the same starter of Gai Satay, which is marinated chicken skewers with peanut sauce, cucumber relish and toast. You had the choice of 4 or 8 skewers and as we were both having it we went for 8 skewers. We both commented that you could hardly taste the peanut in the sauce, which for us was perfect we like it but don’t want it to overwhelm the flavour of the chicken. It was great that the girls meals came out first even though Andy and I had a starter, there is nothing worse than children having to wait for their meal when you are trying to eat your food. Holly had a try of ours too. 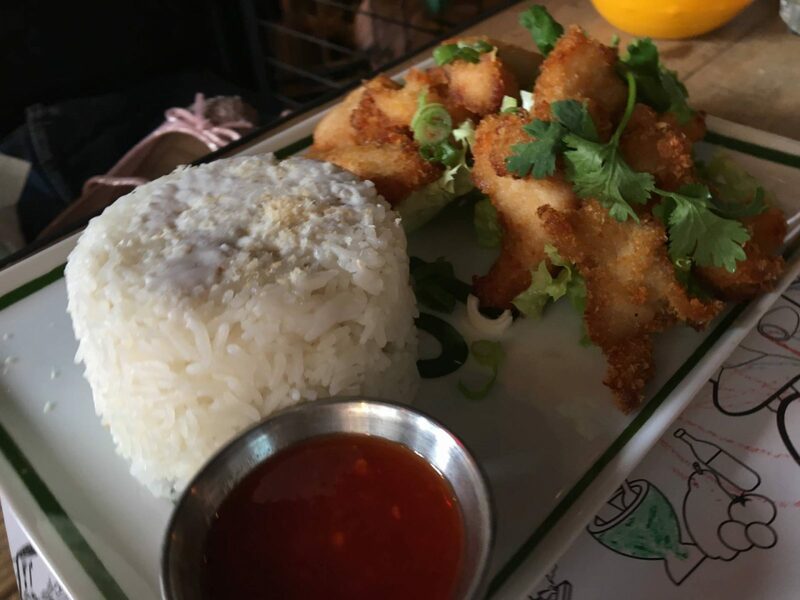 For main course Andy choose the Khao Mun Gai Too, crumbled chicken served with coconut rice and sweet chilli dip. Andy said it was delicious and the rice just had a hint of coconut which was perfect. It was a big portion size and Andy just about finished it all. 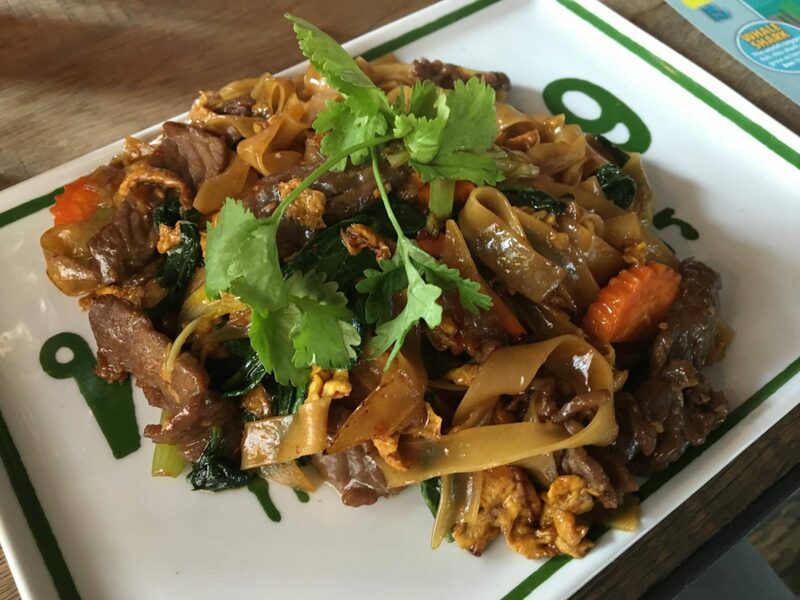 I went for the Guay Tiew Phad Sie Eiew, wide rice noodles stir-fried with beef strips and choi sum leaves in a soy and oyster sauce. Again it was a good portion size and the nicest noodle dish I have had. Andy and I both enjoyed our meals and we were too full to manage a dessert. 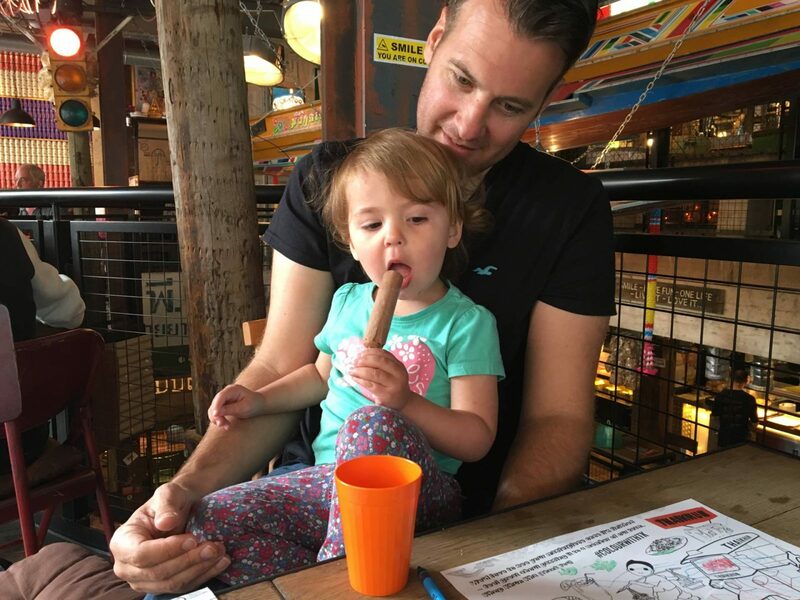 The girls had an ice lolly included in their meal deal and were brought out a mini milk each, which they both loved. 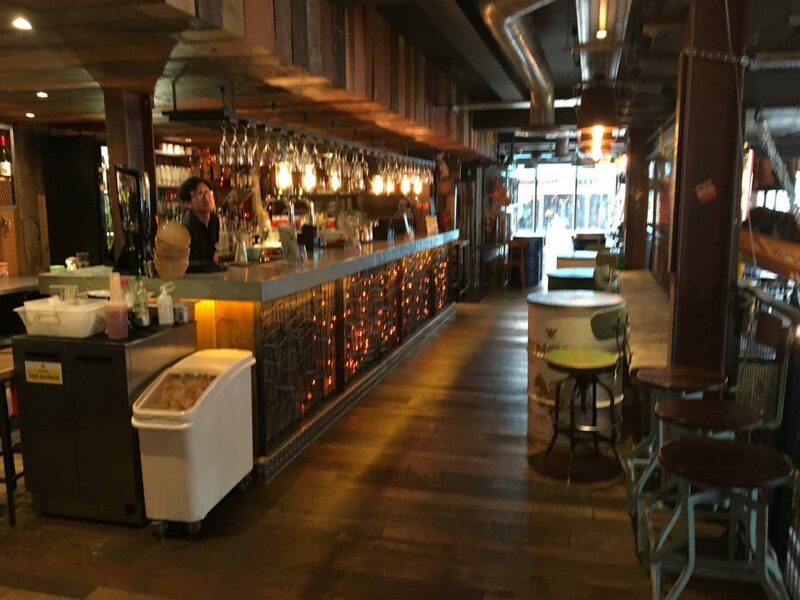 The restaurant had a bar area where you could enjoy a drink before your meal, with some great seating areas. 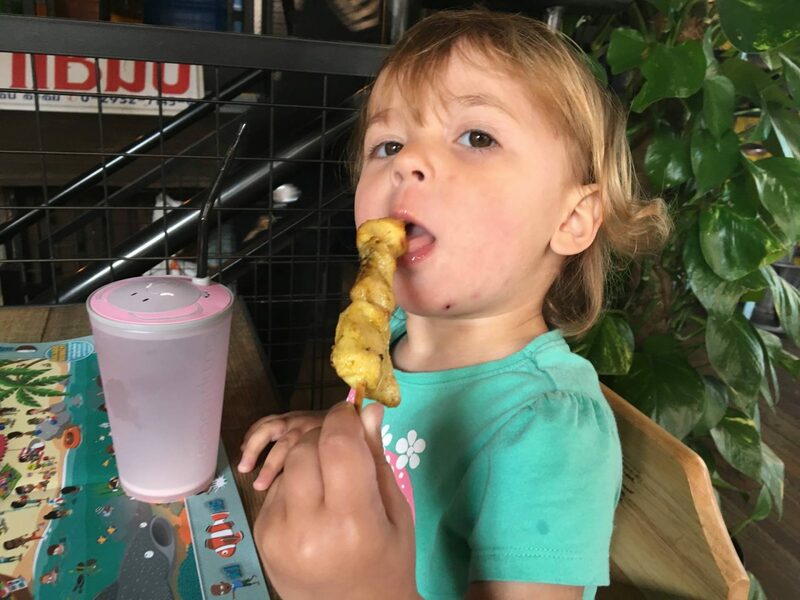 We all enjoyed our food and it definitely opened our eyes up to taking the girls to more restaurants that offer something different for the girls. Our food and drinks came to around £60, which was a good price for all the food and drinks we had. As we were leaving they gave us a loyalty card, where you collect six stamps and on your seventh visit you receive a 40% discount, which is a fab discount and worth doing if you like thai food. 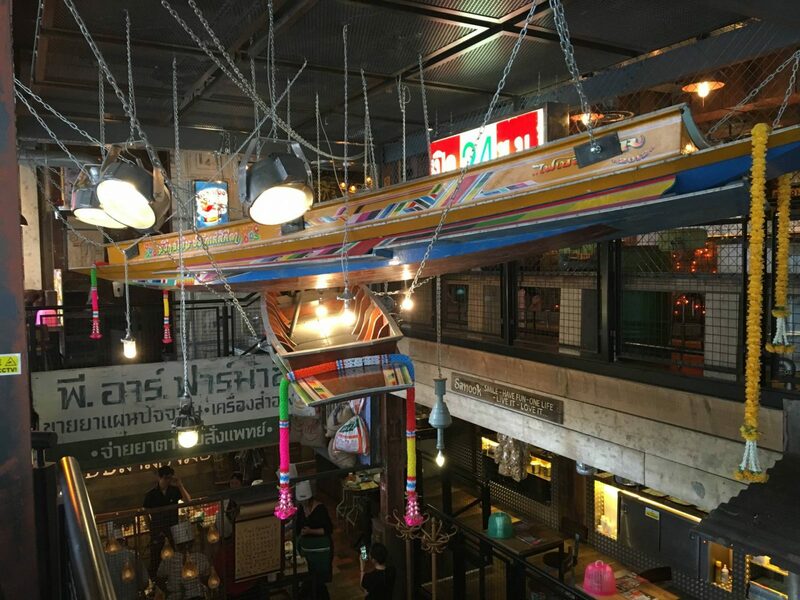 You can find Thaikhun restaurants in other places, take a look here. Oh I’m really glad I read this. We’re overdue a day out in Oxford and we all love Thai food. I love that they have a great children’s menu, the girls always end up sharing with us in our local Thai restaurant as there’s no children’s menu. 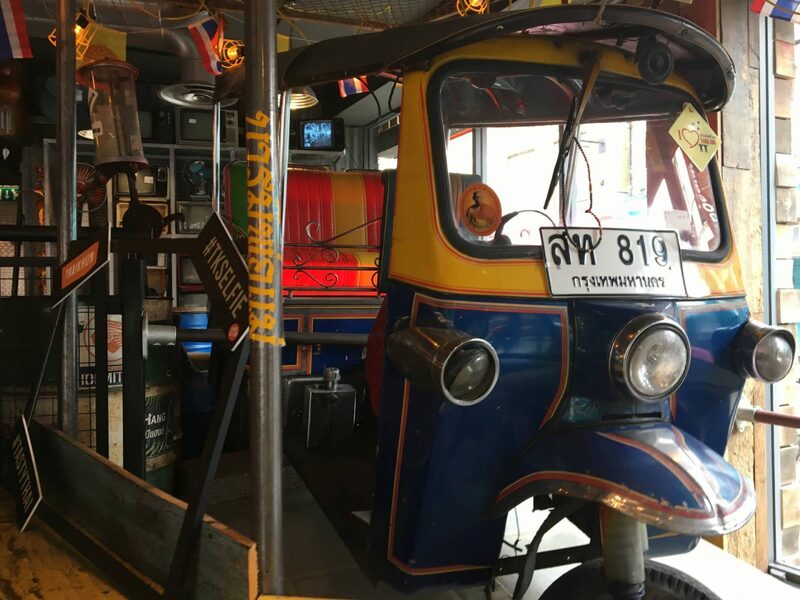 I love that tuk tuk as well, it brings back fond memories of Thailand! That definitely looks like an authentic Thai restaurant. Love that they have proper children’s meals served in proper children’s cutlery. It makes a load of difference when restaurants go out of their way to make their diners feel special isn’t it? It looks fantastic. We have recently visited the same brand in Manchester and I agree its brilliant. I loved reading this review and we had very similar meals. Yummy! 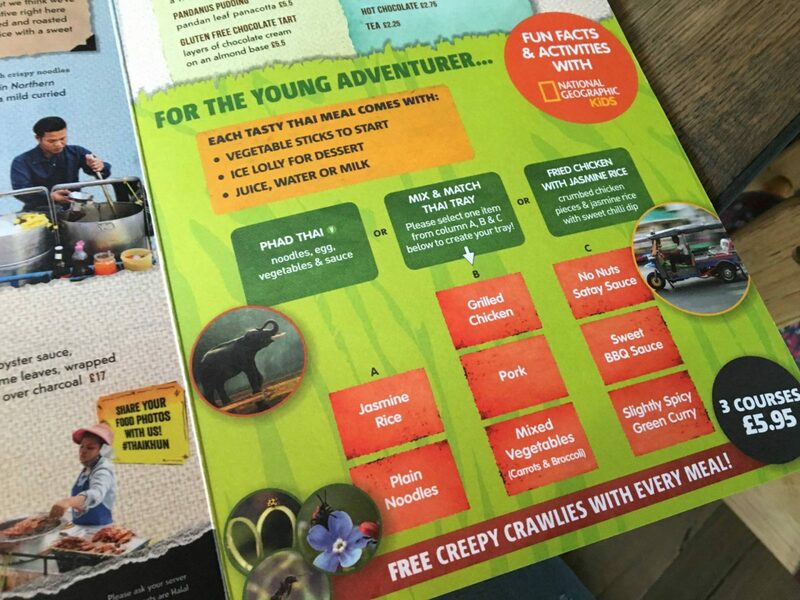 Wow, the children’s meals look lovely. I think it’s so good when a restaurant thinks of the children in this kind of way, it really makes a difference to your visit doesn’t it? I worked in Oxford a few months back and this was one of the restaurants I passed and liked the look of. I like the selection of food available. I was interested to read your review as we are due to eat there later this month, too. It looks really authentic with lots of lovely little, detailed touches and the food looks really fresh and delicious. 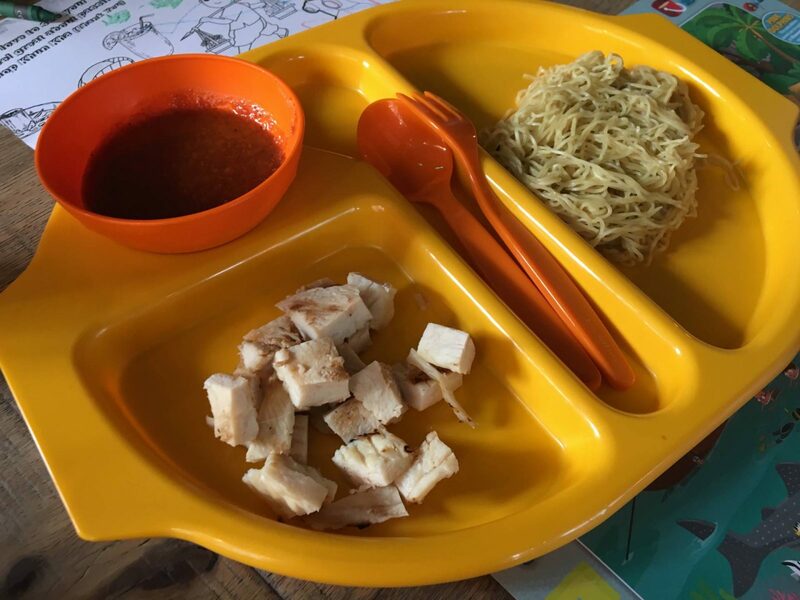 The plastic trays and cutlery would drive my 5 year old bonkers – it’s a bit like the trays you get at school meals. I like the idea of having kid sized cutlery but would prefer normal plates or bowls! Overall looks like you had a really positive, yummy experience! I love Thai food too so this restaurant would be fab for me. I’ve heard a few friends talking about these restaurants and all have had positive experiences. I love that Thaikhun offers kids a break from chicken nuggets and fish fingers! 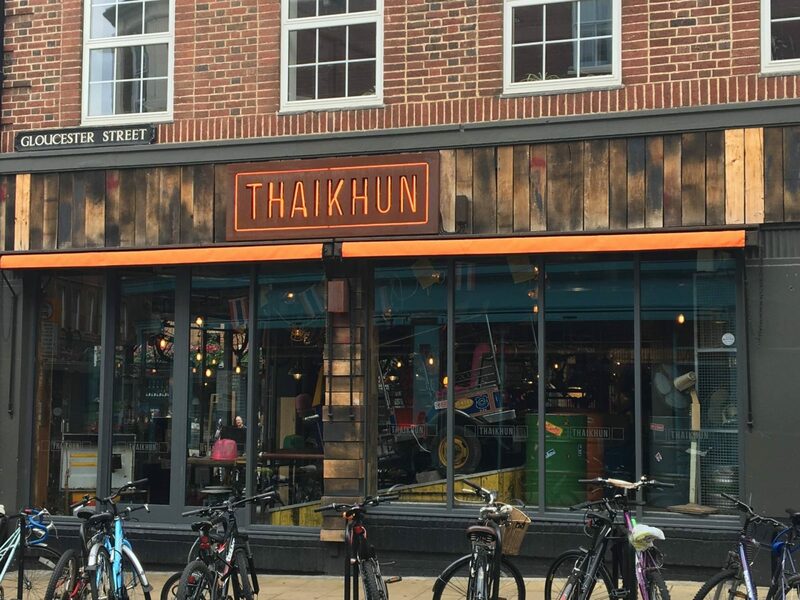 Thaikhun is such a lovely place, I was invited to the opening of the one in silverburn Glasgow and it was beautiful. The decor there is lovely man it’s great that they have different things on the menu for kids.